Integrating virtual reality (VR) and augmented reality (AR) technologies into learning management systems gives businesses an opportunity to measure the capability of employees and identify where improvements can be made. The number of VR applications across a wide range of industry sectors is accumulating at a rapid pace. VR technology has progressed beyond gaming and is finding its way into the corporate space. One of the key benefits organisations are finding is that when VR technologies are integrated into learning management systems (LMS), they have a profound effect on staff training. Whilst standard training methods are a standalone experience that is difficult to monitor effectively, computer simulators enable trainers to collect data that answers questions about how proficient they are. But the massive difference with VR simulators is that employees are put into virtual environments with life-like experiences. When integrated into a learning management system, you have the opportunity to monitor their performance mentally, physically and emotionally, without any risk involved whatsoever. It also helps employees understand their strengths and weaknesses, and exposes them to situations they can use to develop skills quicker and remember information easier. Technology has had a huge impact in today’s corporate world, and we are still in the infant stages of development. Moving your corporate training into the online space and using VR to enhance the programs will move industries on to the next level. Cloud-based eLearning (xAPI) is already proving its worth as an effective training tool. Learning management systems enable companies to create amazing courses content and measure competencies in various areas. However, on their own, LMS only provide an academic test of a employees capabilities. A trainees performance on an LMS, where intellect is analysis is prominent, does not always translate into the workplace when initiative, people skills and the ability to work under pressure may be needed. VR takes LMS to another level. With the capacity to include interactive elements into training programs, you can use online training tools to create replica scenarios they will actually encounter in their job. By using VR and AR to create realistic environments that mimic real-life scenarios, trainers and educators can use LMS to observe the trainees reaction in real-time. Furthermore, people learn much better when they have a visual insight and actually perform tasks for themselves. It makes no difference to the human brain whether the task you are preforming is real, or whether it is merely simulated in an artificial environment. VR headsets work by effectively closing off the senses to the outside world and promoting the illusion that the experience the user is having is really happening. When you become immersed in a simulated environment with an almost identical level of reality, you can trick the brain into thinking the experience is real and it will respond accordingly. This immediate feedback also gives trainers and educators a better understanding of your trainees; their temperament, their ability to handle pressure, their management skills and whatever other potential scenarios you want to create. The opportunity to become accustomed to performing tasks for the first time is hugely beneficial to employees. There are jobs where virtual reality simulators are critical, such as performing surgical procedures and rescue teams for example. However, now that VR is ready for widespread adoption, the development of hardware and software products will grow at a rapid pace. Industries will benefit by creating training environments that can incorporate everything including minor details such as compliance and soft skills. Firms also have a responsibility to provide training to staff that goes beyond the scope of their day-to-day responsibilities. For example, health and safety, first aid and fire training are all legal requirements, and in the main are very dull. VR brings an entirely new dimension to these types of mundane and compulsory training sessions. You can physically turn a passive learning experience into an active one by incorporating visual cues to emphasise the most important aspects of the training program. 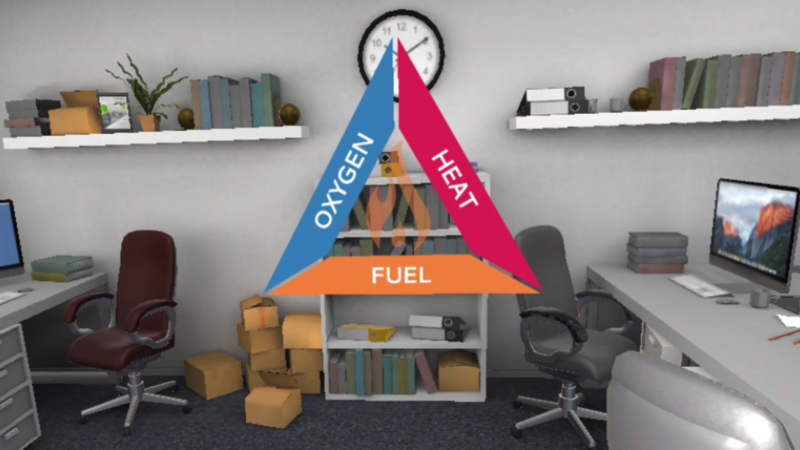 To give you a better idea, take a look at this VR fire training video we created and note how you can use visual cues – known as “signalling” to good use. A study performed by the University of Florida, School of Teaching and Learning, shows that incorporating signalling into a training program enhances the user-experience and makes the training process more effective. It also makes people better at doing their job in a shorter space of time. VR technology may have taken a long time to crawl into mainstream markets, but now its here, corporate enterprises have a prime opportunity to incorporate VR technologies into your learning management systems and improve all areas of your business. If you would like to discuss how you can integrate VR into your learning management system contact us here.